Patient History: This patient had a short period of severe acne in her 20’s which left divoting scars on her cheeks. She had four sessions of microneedling done over a year prior to visiting us at Azura Skin Care Center. She, unfortunately, saw no results and was about to try Fraxel resurfacing at the practice she went to prior for her scars but wanted another option. She was concerned about hyperpigmentation with the laser. We discussed the options and decided to try microneedling again as it seemed her scars could be managed in this way. We used a Growth Factor topical with each microneedling visit and had her use Biogel by Neocutis twice daily through her process. 30 days after her first treatment she returned for her second treatment. She could see remarkable results in this short time and was pleased with each visit after. She states her treatment at Azura was much more thorough than her prior four treatments elsewhere and felt the technique made the difference. We will be sure to update you when she follows up from her third visit! Visit our Microneedling page to learn more about this treatment at Azura Skin Care Center. Visit our Lights and Lasers page to learn more about this treatment at Azura Skin Care Center. Patient History: This patient had worked very hard to get her weight to where she wanted it to be and was feeling very healthy overall. Although, no matter how hard she worked at getting the appearance of her abdomen where she wanted it to be, she could not get that last bit of unwanted to contour to diminish. We performed one 60-minute Exilis treatment every week for four weeks for a total of four treatments. By the third week she noted a great change and as you can see on her one month follow up her results are very impressive. She is now happy with the appearance of her abdomen and thrilled with her results. Patient History: This patient had unwanted lower face and neck fullness that she desired to diminish. She stated that no matter her weight, this area had always been more prominent than she desires and many women in her family have the same lower face and neck appearance. We performed one 60-minute Exilis treatment once a week for three weeks in a row. She was able to see change with each treatment and these pictures show the change between a four week period of time. Before and after Dysport® treatments on forehead. After Dysport® treatment and treatment of rosacea with products. Before and after Dysport® treatments on the client’s forehead, as well as treatment of rosacea with products. 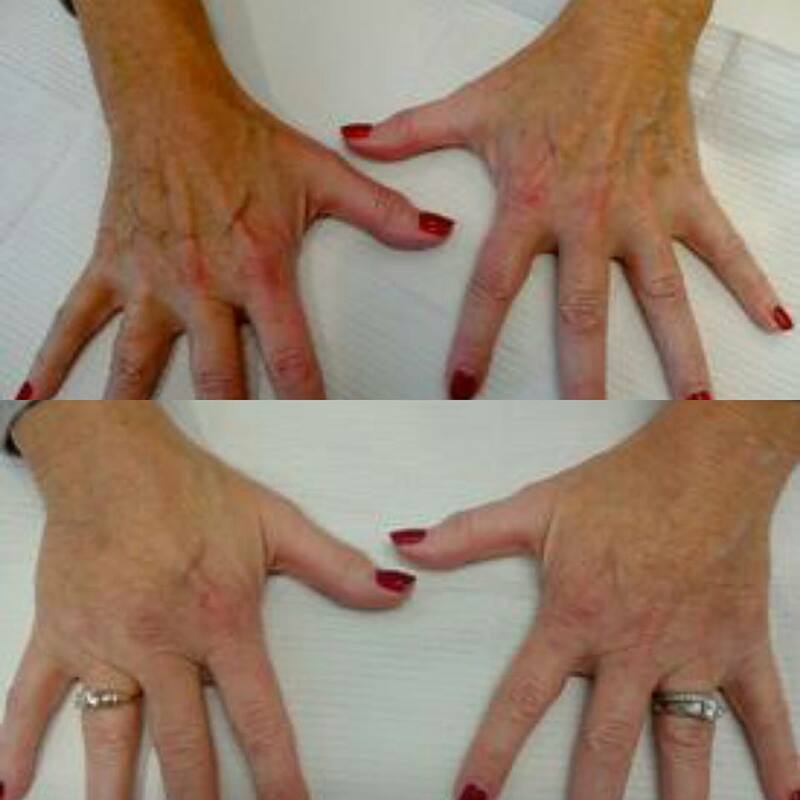 All this client wanted for Christmas was to have hands that look 10 years younger. We have to ‘hand it’ to Jennie Kowaleski PA-C. She delivered exactly what the client desired… maybe even more than 10 years! This more youthful appearance was achieved with dermal fillers to replenish volume. When we lose volume in our hands, the hands appear more bony and the veins become prominent. 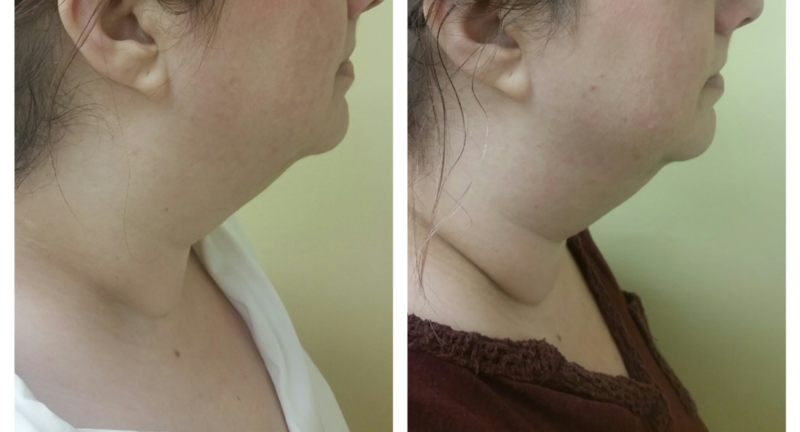 Azura Skin Care Center patient before and after two Kybella treatments – six weeks apart.